Original of 1913 Transporter part of the Rendsburg High Bridge irreparable; German government plans reconstruction. RENDSBURG, GERMANY- Relief but also with mixed reaction from the residents of Rendsburg, as well as those in the German state of Schleswig-Holstein and many preservationists and pontists alike regarding the city’s prized architectural work, the Rendsburg High Bridge. The transporter portion of the cantilever Warren through truss bridge, built in 1913, sustained substantial damage in a collision with a ship on 8 January. Despite campaigns to rebuild the original transporter and operator’s house, the German Ministry of Transport has just announced that because of the extensive damage, it cannot be salvaged. Instead, a brand new transporter will be constructed in its place. A sigh of relief or a sign of disappointment for the people who are attached to the bridge? According to an interview with the newspaper SHZ, Rendsburg’s mayor Pierre Gilgenast, the reaction is mixed. On the one hand, he and many others are disappointed that the original transporter cannot be replaced. On the other hand, building a brand new transporter will eliminate the need to have a ferry trafficking people across the Baltic-North Sea Canal (a.k.a. The Grand Canal). Since June 7th, two ferries have been bussing people across the heavily travelled canal for eight hours daily on workdays only, and on weekends during the school summer break. This is a temporary relief for commuters who have been using the Rendsburg tunnel and the Europabrücke at Motorway 7 to cross. A lot is at stake for the Rendsburg High Bridge. At the moment, neither the timeline of the construction of the new transporter has been given nor has money been earmarked for the project, yet the mayor and other parties are working with authorities in Berlin to have a concrete plan as to when the new portion will be built. Gilgenast is hoping that the plan and the project will start as soon as possible. In addition to that, the damage to the transporter has hurt the chances of this unique superstructure to be listed as a World Heritage Site by the international organization UNESCO. Originally, the bridge was expected to be listed at the earliest 2017. The city is hoping that the replica being planned is exactly like the original that was destroyed in the collision. For almost 20 years, the structure has been declared a Technical Heritage Site on the national level. It is hoped that the accolade reaches the international level, but all of this depends on when and how the transporter is rebuilt. Built in 1913, the Rendsburg High Bridge is the centerpiece of the architectural works of famous German engineer, Friedrich Voss, whose credit also goes to the building of the Hochdonn Bridge, the Arch Bridge at Friedrichstadt and the now demolished Prince Heinrich Bridge in Kiel. The Rendsburg High Bridge features a loop approach span north of the Grand Canal built using brick arch and steel trestle spans, inspired by the construction of the now demolished Hastings Spiral Bridge in Minnesota. The main span features a cantilever Warren through truss, which carries rail traffic between Flensburg and Hamburg. Underneath the truss span is the transporter span, which had carried pedestrians and cyclists across the canal prior to its collision with the freight ship in January. An article with videos and photos, written by the author of the Chronicles, can be found here. Part of the reason behind the push for the new transporter has to do with the reconstruction of the Europabrücke. The 1971 bridge is scheduled to be replaced beginning in 2018 to accomodate six lanes of traffic along Motorway 7 between Hamburg and Denmark via Flensburg. The project will be conducted in phases with one half of the new span being built alongside the old span, followed by the demolition and replacement of the old span once traffic shifts onto the portion of the constructed new span and finally the construction of the new approaches and the widening of the motorway once the other portion of the new span is constructed and open to traffic. It’s expected to take eight years to build. More on that bridge as well as other structures along the Grand Canal can be found in an SHZ article here and in the Chronicles here. Side view of the bridge taken in Aug. 2013. The eastern half- a Pennsylvania petit and a Pratt are all that is left of the bridge. Those are to be taken down soon. BOONE, IOWA- Three years ago, the Wagon Wheel Bridge was one of the main attractions of the Historic Bridge Convention, which was attended by over 25 pontists from five states and two countries. It was originally part of the Kate Shelley Tour conducted by the Boone County Historical Society. It was one of the longest multi-span truss bridges ever built by the Iowa Bridge Company, one of many in-state companies that had dominated the scene since the consolidation of 29 bridge companies into the American Bridge Company consortium in 1901. The 1910 bridge had a total length of over 700 feet. Now the steel span is coming down for good- in sections. Workers from the Hulcher Services began pulling down the western half of the bridge yesterday, which included two Pratt through trusses, one of which sustained damaged in an ice jam in February and subsequentially fell into the river in March. According to the Boone County engineer Scott Kruse, as soon as the water levels of the Des Moines River recede , the eastern half, featuring the Pennsylvania through truss and another Pratt through truss will be removed. The cost for the bridge removal will be $150,000, some of which will be deducted from the county highway fund, while the taxpayers will contribute to the rest of the expenses. For many who know this bridge, it brings to an end a bridge that had historic character but was highly ignored and neglected. Closed since 2007, the bridge sustained damage to the eastern approach trestle spans in 2008 during the Great Flood. It took four years until new wooden decking was built on the span, but not before residents having voted against the referendum calling for the replacement of the bridge in 2010. Debates on the future of the bridge came to a head, as talks of converting the bridge to a memorial honoring Kathlyn Shepard came about in 2013. 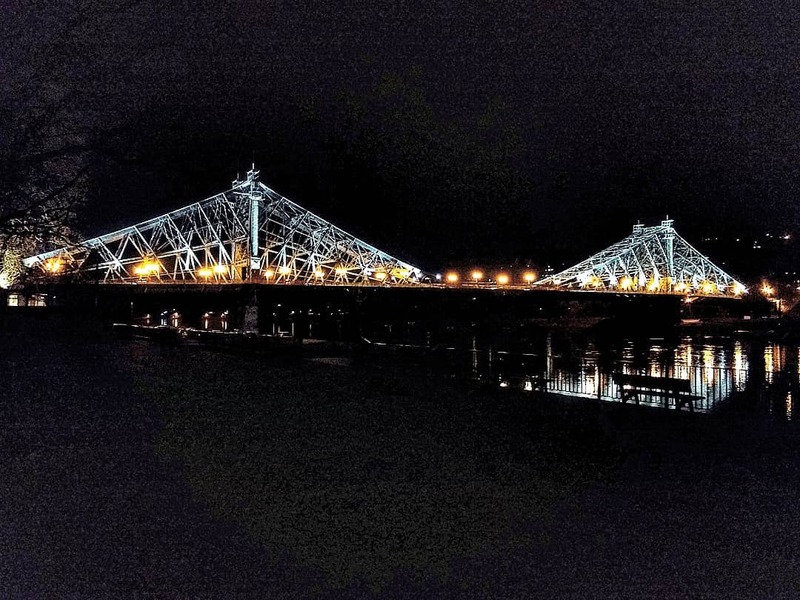 Reports of the leaning pier between the collapsed Pratt through truss and the one closest to the Pennsylvania truss span raised concerns that the structure would collapse, creating warnings even from local officials that one should not cross the bridge. But the last ten months brought the bridge to its untimely end, as vandals set fire to the eastern trestle spans last August, prompting the county to removed them completely. The arsonists have yet to be found and apprehended. The ice jams and the subsequent collapse of one of the spans, prompting the county engineer to put the bridge out of its misery for good. The removal of the Wagon Wheel Bridge brings closure and relief to the city of Boone and the county, for despite pleas by preservationists to save at least part of the bridge, the county is doing its best to eliminate a liability problem that has been on the minds of many residents for nine years. The county engineer declared that they do not want any more problems with the bridge and therefore entertains no plans for keeping what is left of history. The mentality of “Good riddance to bad rubbish,” is floating around in the community, yet the city and the county will lose a key piece of history that was part of Kate Shelley’s childhood past as well as the history of Iowa’s transportation heritage. A piece of history which, if thinking dollars and sense, could have been saved years earlier, had everyone read their history books in school, and come together to contribute for the cause, that is. One wonders what Kate Shelley would think of this. Facts about the bridge, based on the author’s visit in 2010 can be found here. If you wish to know more about Kate Shelley, a link to her life and how she became famous can be found here. The Bridgehunter’s Chronicles has changed its cover pages on its facebook and twitter sites to honor the bridge and its heritage. If one is interested in relocating the Pennsylvania span, please contact the engineer using the information here. Hurry while the water levels are still high! It is unknown if even a marker at the site of the bridge will be erected once the bridge is gone. Given the sentiment towards seeing the girl leave, chances of happening is highly unlikely unless a book is written about the county’s bridges or the bridges along the Des Moines River and the bridge is mentioned there…. Niland’s Corner Bridge to Become History? Niland’s Cafe and Motel, one of the last of its kind that features a diner and a Sunday brunch with food prepared by hand from the home kitchen. The motel used to serve as a campground before being converted to mini houses to put travellers up for the night. The first known interchange in the country. The third key element is at stake as officials from Iowa DOT are looking at improving the intersection. The interchange was built in 1936 and was once used as an entrance ramp for Sherman tanks heading to military bases to be transported to Europe in World War II. The overpass, a steel plate girder span, was constructed in 1938 and still crosses the Jefferson Highway (now US Hwy. 65) on the Lincoln Highway (now county highway E-41). The interchange is the prototype of the interchanges we see today on all freeways in the US, Canada and parts of Europe. Because of problems involving low clearance, the DOT has proposed one of two alternatives to improve the intersection. The first is to rehabilitate the bridge and improve the intersection while installing sensors to alert drivers of oversized semi-trucks of a low clearance, warning them to get off the highway (an article can be found here). The other option- one that has met opposition by locals and historicans- is to eliminate the entire interchange and install a four-way stop intersection. That option will completely alter the landscape of the corner as several buildings and trees would need to come down and only part of the ramp would be used as an entrance to the parking lot of Niland’s Corner. This leads to the situation at hand: Is it worth the millions of dollars being doled out to alter Niland’s Corner to a point of no recognition, losing the historic status and the attractiveness of the people attached to the historic highway, or would it make much sense for truckers to use the alternative routes and save taxpayer’s money; furthermore, preserve this very unique and historic mark? Logic says take the Interstate to Albert Lea, Minnesota, where accomodations are plentiful for truckers and allow Colo to thrive under the tourists. After all, less is more for the small community and people can enjoy a little history and some good home-cooked food for a night. Or perhaps some pics, as this author indulged profusely in doing during his visit with his family in 2013 (click here). Southern portion of the prototypical exit and the railroad underpass. Information on the Lincoln and Jefferson Highways can be found here (L) and here (J). Crow’s Bridge for Sale: Any Takers? PUTNAM COUNTY, INDIANA- The state of Indiana has long since been the poster boy for preserving historic bridges- in particular, those made of iron and/or steel. Putnam County has a wide selection of bridges of all sorts made from various materials, even though the number of truss bridges have diminished over the past 20 years. This explains the reason why the county would like to keep this bridge, but to give it to someone who is willing to reuse it. The Crow’s Bridge, located over Big Walnut Creek north of Greencastle, has been in visier of the county for at least five years because of its age. Yet despite its rust and a builder’s plaque that has been the target of irresponsible shooters, the bridge is one of a few examples of pre-1910 truss bridges made with pinned connections and built by the American Bridge Company. The bridge was built in 1902 by the company, two years after its creation through the merger of 29 bridge builders, using the steel from the mills in Gary. It is unknown where the bridge was prefabricated and where the agents were located during that time, but given its proximity to Illinois, it is likely that the bridge came from one of the branch offices in Chicago that used to be Lassig and American Bridge Works, respectively, one or both of whom had connections with the steel mills in Gary. In terms of description, the bridge was one of the last examples of truss bridges built with pinned connections and using a Pratt through truss design. Its portal bracing consists of a 3-rhombus Howe Lattice portal system with subdivided heel bracings having an angle of 45°. The struts feature V-laces with 45° heel bracings. Only a portion of the oroginal Howe lattice railings remain as the rest was replaced with modern steel railings. Upon its removal and relocation, the decking was all wood. The bridge is 121 feet long, 15.7 feet wide and 16.5 feet high. As in other bridge examples that can be found in Indiana, this bridge would be a perfect fit as part of a bike trail system, picnic area at a park or even as a secondary road crossing, if the structure is rehabbed accordingly to accomodate vehicular traffic. At the present time, the truss bridge has been relocated to a field and is awaiting a new permanent home. It is currently being replaced with a concrete structure, unfortunately at the expense of historic wingwalls with inscriptions on there, as seen in the photos posted on bridgehunter.com (click here) and historicbridges.org (click here). If you have an idea what to do with the bridge and would like to take it home, please contact the Putnam County Engineer’s Office or Dan Reitmeyer at this address: danr@clrincgrp.com. You can also contact Jason Smith at the Chronicles, using the contact form under About the Chronicles. Staying in Saxony-Anhalt for the next mystery bridge article, we head back to Halle (Saale). As many of you have probably read, the city along the Saale River has over 38 bridges along this main river, its tributaries and even along the ICE rail line. While there is a tour guide that takes you to the city’s bridges through the Chronicles and Halle in Bild, neither authors figured in that there would be a few additional outlyers with historic value that should be taken into account, and added. Like this railroad crossing, for example. The finials were located only at the southern entrance to the structure, right before entering the platform of Halle Central Station. They resemble sword-shaped towers resembling Washington Monument in the United States, with Victorian-like foundations, standing on the abutments made of sandstone and limestone brick and concrete. An inscription with the year 1909 indicated the year the bridge was constructed, spanning Delitzscher Strasse. The bridge’s railings are made of cast iron and feature a parapet that has circilar and mushroom shapes with posts that feature a pyramid-shaped finial and a an outrigger per post that resembles a raindrop. 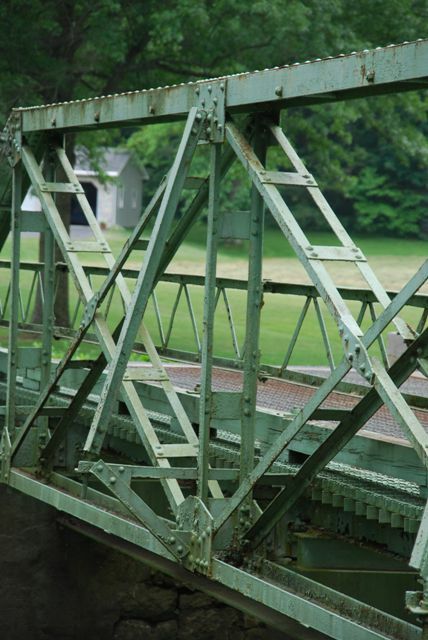 Outriggers are diagonal posts that slant outwards at an angle 60-80° and used to support the trusses for pony truss bridges and railings for stringers, like this one, regardless of length. Many stringer bridges in Germany have these ornamental outriggers which makes the structure rather attractive. In America, one will see most outriggers on truss bridges, especially those built after 1900 with riveted connections in the form of Pratt, Howe or Warren truss designs, and have geometric shapes. Judging by the main span, it appears that the structure is one of two bridge types: 1. It is a stringer which was constructed a few years ago to replace an arch bridge with either open-or-closed spandrel design or a truss design. This would make the most sense as Delitzscher Strasse is one of key streets connecting Halle City and the train station with points to the west, including Delitzsch, the Leipzig-Halle Airport and neighboring Leipzig. To accommodate more traffic, the arches were removed in favor of the stringer span, but the ornamental railings and the finials were preserved as historical markers, showing people where the bridge used to stand. With the modernization of Halle Central Station, this theory would not come as a surprise, given the fact that the complex was in such a desolate state during the time of the East German Communist rule. Halle Hauptbahnhof Complex as it stands today. Then there is option two, which is the stringer has stood since 1909 but had to be rehabilitated to accomodate rail traffic. This theory is tall but doable as engineering experiments have been done to either strengthen or partially replace the decking while keeping the bridge design in place, a concept that costs less money than a full replacement. Yet, given the modernization-happiness of the Deutsche Bahn, which owns the lines and the railway station complex, it is doubtful that the firm would go for quick fix-ups, as they want to conform to the modern rail standards and would rather have new bridges that function for 100 years than to have a restored bridge, like this one. Whe one looks at the firm’s campaign to have the 53-year old Fehmarn Bridge in Schleswig-Holstein torn down and replaced or the Chemnitz Viaduct replaced, one will understand why the Bahn is not listening to alternatives by local and regional governments. By the way, the fight to save the bridges is still on, and other European countries have modernized their rail lines but kept their historic bridges, including Great Britain, Spain, Portugal, and even Belgium. When was this bridge built and who was behind the design? Is the current bridge the restored original or a replacement? If the latter, when was it replaced? If the bridge was restored, how was it done and who led the efforts? Who was behind the design of the ornamental railings and finials? While on the subject of the German state of Saxony-Anhalt as there is a quiz on this subject (click here to challenge yourself), there are a few historic bridges in the state that many of us don’t know about. Many of them have been abandoned, and the little records that may have existed in the past vanished because of war and political oppression. Saxony-Anhalt was one of five German states that fell under the rule of two different dictators between 1933 and 1990: The first with Hitler and the second under Communism. During that time, records of these structures were either lost or altered in an attempt to prop up the goodness of these two regimes, when they anything but that. This railroad viaduct in Grosskorbetha is one of these gigantic structures that has been sitting abandoned for decades and whose records on its history may have been lost to time and the iron fist. Grosskorbetha is a village in southern Saxony-Anhalt thatis the bridge between the industrial area to the north and the wine industry to the south. It is a transitional point in terms of landscape where going south, one can see the limestone hills lining along the Saale and Unstrut Rivers. Going north, it has nothing but flat plains. It is an outlyer to the megalopolis region of Leipzig and Halle, which includes Bad Durrenberg, Merseburg, Schkopau, Delitzsch and Bitterfeld-Wolfen. And it is the Grand Central Station (or in German terms, Hamburg Hauptbahnhof) for all freight trains, especially as they branch off into three parts going north: to Leipzig, to Halle and to the petroleum area in Leuna. For passenger train service, no one can escape seeing these trains and industrial complexes when passing through. And for this railroad bridge, which is an nine-span closed spandrel concrete arch bridge, it is the structure which one will pass through by train, noticing all the cracks and spalling, the barriers keeping everyone off the structure, but one will have a difficult time photographing it. This shot was taken by train but at speeds of 120 km/h. The bridge is located a kilometer north of the train station, which makes walking ti the structure impossible, given the high volume of traffic at this junction. Even Nathan Holth would face the wrath of the Bahn in one form or another if he was to even try to walk to the bridge. 😉 But what we can say about the bridge is it is at least 80 years old, and it has withstood damages caused by war, wear and tear and trains passing through. Crossing the main passenger lines heading to Leipzig and Halle, one could say the bridge is well over 170 meters long. And the width is enough to hold vehicular traffic in both directions, especially when it connects Leuna and Grosskorbertha. But…..
What else do we know about this bridge? Any ideas in English or German would be of great help. Author’s Tip: As a tip when photographing bridges like these: If you cannot zoom in with your camera, try by train, but use the speed modus, and fire away as you approach the bridge. If you miss, turn around and try when the train goes away from the bridge. The second step is easier than the first, but you will be able to get a “drive-by” shot while the train is in motion. My success here came after the train passed through the bridge, except it was with the red regional trains which have since been decommissioned due to age. They featured windows you can open and stick your arms and camera out for a good shot. With the newer trains by the rail service Abellio, the windows are fixed shut and it may be more difficult to photograph with a closed window, but still, it is doable.